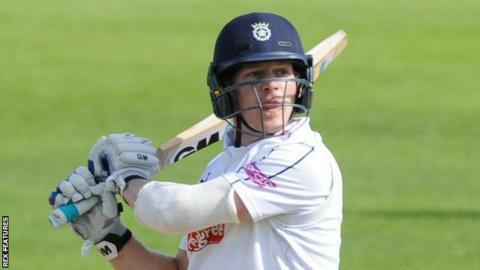 Hampshire batted for two sessions on day four to ensure their Championship match with Middlesex ended in a draw. The hosts resumed their second innings at The Ageas Bowl on 76-1, a lead of 51, before declaring on 290-5 at tea. Opener Jimmy Adams was removed by Steve Finn (2-59) after making 70 before Adam Wheater (57no) and Ryan McLaren (46no) shared an unbroken stand of 104. Set 266 to win off 31 overs, Middlesex lost Sam Robson for nought, but closed out the game on 55-2. Hampshire and Middlesex have both drawn their opening three Division One matches of 2016. Middlesex went into the final day knowing they needed quick wickets to force an unlikely win, and Toby Roland-Jones provided an early breakthrough when he had Hampshire captain James Vince caught at backward point by Robson for 38. However, Adams batted throughout the morning session to take Hampshire to 172-3 at lunch. England pace bowler Finn provided a glimmer of hope for the visitors after the interval, dismissing Liam Dawson and Adams in consecutive overs, but wicketkeeper Wheater and all-rounder McLaren removed any chance of defeat with a fine century partnership.